Is the Commonality just a bit too 'nice' for you? Or would you like to spread its principles to those who have other opinions? Publisher's blurb: "Welcome to the Bright Empire of Venu - the interstellar civilisation of the 'bad guys' of Human Space! An ancient people of xenophobic human supremacists, survivors of an ancient war, now hellbent on cleansing the cosmos of abomination and bringing the purifying word of their undying God-Emperor to the stars. 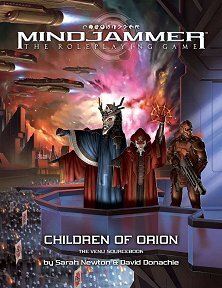 "Children of Orion - the Venu Sourcebook provides a whole new universe of adventure for your Mindjammer games - a harsh and violent interstellar empire beyond the Commonality frontier. Play rebels against the domineering rule of the God-Emperor, mutated troopers and servitors of the sinister Dark Radiance fighting against the cultural inroads of the Commonality - or Commonality agents themselves, working behind enemy lines to defeat an implacable foe which once devastated the Core Worlds! It's a completely different vibe for your Mindjammer games - darker, more desperate, where the survival of an entire people is at stake."